PLEASE NOTE: This pattern is written in one size and calls for a yarn that is long-discontinued. Be sure you know what you’re doing before you start it. I designed this to be very fitted so Mark could wear it for cycling. The body and sleeves are extra long, so no skin sticks out when he is bent over with his arms stretched out. It worked out really well! This garment only comes in one size. It should be quite easy to change the size a bit, if you’d like. Shorten or lengthen the body and arms as you see fit. If you need a bigger chest, adding purl stitches between the cables should help. Yarn: 8 skeins Annabel Fox Chunky Donegal in Walnut. 3.5 oz. /109 yards per skein. This yarn is discontinued. Recommended gauge for it is 3 3/4 sts per 1 inch. Nice subs would be Rowan Cork, Scottish Tweed Chunky (exact same yardage and everything! ), Blackberry Ridge Woollen Mills’ bulky weight two ply wools, or Bartlettyarns’ 3 ply. Mainly, I’d suggest a yarn with at least two plies that’s woollen spun so that it’s a light and lofty yarn, which will make a sweater that doesn’t weigh so much. Repeat for 2”, increasing to 40 sts. evenly across last row and ending with RS facing. To set up for cables, do rows 1 and 2 from chart, leaving out the center cables, working those sts. in stockinette instead. Beginning on row 1 again, this time following chart, including center cable sts., knit to 17”, then bind off 4 sts. at the beginning of row (sleeve edge), K1, SSK, work across in pattern. Do WS row in pattern. Decrease on RS row by K1, SSK, knit across in pattern, 2 more times, then work straight in pattern to 23.25”. Bind off 5 sts. at neck edge on next WS row. Decrease one stitch at neck edge, every WS row, 3X. Knit in pattern to 24.5”. Put shoulder sts. on holder. Make right side front piece by reversing shaping (use K2TOG instead of SSK) and chart. Continue in this ribbing for 17”. Shape armholes as for fronts. Cast off center 17 sts. for neck, putting shoulder stitches (on each side) on holders. After knitting straight 1”, increase 1 st. on each end of row, every 6th row to end up with 65 sts., keeping in rib pattern. Knit straight in rib to 24”. Next RS row, cast off 5 sts. at beginning of next two rows. Decrease 1 st. at each end of RS row, 4X. Make another sleeve in the same way. Knit shoulders together. Sew sleeves in and sew side seams. Pick up 49 stitches around neck from RS of work. Repeat these rows to desired length. Bind off loosely. 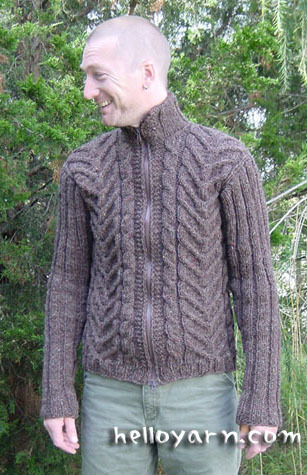 If desired, using a finer, softer yarn, line collar by picking up stitches from the right side of work and knitting a flap to fold over and cover inside of collar, down to and covering the seam connecting collar and sweater back. Install zipper and fold collar flap over and sew in place.